Herbie’s Spices fills a need in the community of cooks and food lovers for one central website to access all those hard-to-find herbs and spices. They also stock the easy-to-find ones, of the freshest and best quality, so that you can stock up on all your spices and herbs from the comfort of your own home. Herbie’s Spices are also available from many selected stockists around Australia. To find a stockist, simply search Stockists by entering your suburb or postcode. The blends and spice mixes made at Herbie’s Spices contain no fillers, starches, MSG, free-flow agents or additives of any kind, so you know they will be rich in flavour and quality. Using his vast knowledge and experience for your benefit, Herbie has the widest possible range of top quality dried herbs, spices and blends to meet your every need. Herbie’s also publishes a newsletter every few months, full of handy information about all things spicy. You can subscribe to it and Newsletters are also available here on the website. You’ll also find spice-related books, and lots of easy to use spice kits to buy for yourself or for a gift. Liz Hemphill and Ian were married in 1970. Throughout the years while their three daughters were young, Liz worked in the family business, as well as picking and drying lavender, roses and lemon verbena for literally thousands of her hand-made sleep pillows. It was during this time that she wrote Your First Book of Herb Gardening published by Angus and Robertson, and realised that herbs and spices could inspire home cooks and enhance everyday meals. 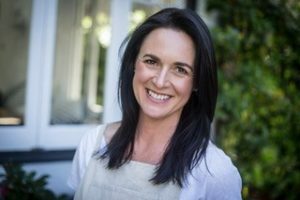 When Liz and Ian established Herbie’s Spices in 1997, Liz took on the tasks of recipe development, writing quarterly newsletters and managing the accounts, along with the myriad of tasks that are involved in running a family business. Kate Hemphill, Ian & Liz’s eldest daughter, is an accomplished cook, a graduate of Leith’s School of Food and Wine in London, recipe contributor to The Spice & Herb Bible, and developer of most of the inspirational recipes you will find on this website. Having grown up in a herb and spice family, Kate remembers playing in her grandmother’s herb garden, and sitting down to family dinners that were always beautifully spiced! In 2000 Herbie’s Spices was the winner of the Gourmet Traveller Jaguar award for excellence for Innovation in Produce. Ian’s first book “Spice Notes” A cook’s compendium of herbs and spices was launched in October 2000 and was received with wide acclaim. In 2001 Spice Notes won the coveted Food Media Club Food Writer’s award for best hard cover food related book in Australia. Shortly after at “Tasting Australia” in Adelaide, Spice Notes was one of eight nominees for the Jacobs Creek award for best hard cover food related book in the world. Indian Tourism awarded “Herbie’s Spice Discovery Tour to India” an Award of Excellence. In 2002 Spice Notes was published for the American market under the title there as “The Spice & Herb Bible”. In September 2002 Ian’s second book Spice Travels – A Spice Merchant’s Voyage of Discovery” was launched and was nominated in the Best Food Book category for the Jacobs Creek World Food Media Awards 2003. In March 2003 “Herbie” was awarded the Food Media Club Australia Peer Industry Award for Best Overall Contribution to the Communication of Food, at the Vittoria Australian Food Media Awards 2003. Herbaceous – A Cook’s Guide to Culinary Herbs, authored by Liz and Ian was launched in April 2003, and has been warmly received by herb lovers around Australia. In September 2004, Herbaceous was awarded a Highly Commended at the Vittoria Australian Food Media Awards 2004. Spicery – A Cook’s Guide to Culinary Spices, written by Ian & Elizabeth Hemphill with Philippa Sandall, was launched in October 2004. In December 2004 Spicery was awarded Best Single Subject Cookbook – English, in the Gourmand World Cookbook Awards 2004. In Early 2007, Herbaceous and Spicery were combined into one edition and launched under the title “Sticks, Seeds, Pods & Leaves – A Cook’s Guide to Culinary Herbs and Spices” with over 150 recipes. Spice Notes and Recipes – A new edition of Spice Notes with new listings, additions and over 60 new recipes developed by Ian and Liz’s daughter Kate, launched in November 2006. This new edition is also published in the USA as The Spice and Herb Bible Second Edition. The USA edition was joint winner of the Best Reference Book category at the International Association of Culinary Professionals Cookbook Awards in Chicago in April 2007. In October 2007, Ian “Herbie” Hemphill was inducted into the Sydney Morning Herald Sydney Magazine’s Food Hall of Fame. Herbie & Liz also take groups of tourists to India nearly every year on a Spice Discovery Tour that explores the sights, sounds, flavours and atmosphere of India. To date they have led 10 of these tours to India since opening Herbie’s Spices. In October 2008, Channel 9’s “Fresh” sent Herbie to South India to record 10 six minute segments which went to air mid November 2008. In April 2010, Just Add Spice, published by Penguin was launched. Just Add Spice was co-authored with Lyndey Milan and has been received with critical acclaim by the media. In July 2011, Ian & Liz Hemphill were presented with the trophy for Herbie’s Spices for winning the Most Outstanding Providore in the ABC Delicious Magazine 2011 Produce Awards. In 2012 Herbie and Lyndey Milan made a TV series called ‘Moveable Feast’ which aired in New Zealand in 2012 and in the Ukraine and Croatia in 2013 and Australia in 2015. In July 2013 www.foodandwine.com named Herbie’s Spices in their list of Best Spice Shops in the World, this only Australian spice business recognized. In the same month, Herbie’s Spices was nominated as a Regional Finalist in the New South Wales Business Chamber Business Awards. In October 2014, the 800 page third edition of The Spice & Herb Bible was launched in Canada, the USA, the UK and Australia. In 2015 it was a finalist in the ‘Reference and Scholarship’ Category of the James Beard Awards, which many consider to be the ‘the Oscars of the food world’. Ian is Immediate Past President of Food Media Club Australia Inc. (later called Australian Association of Food Professionals), he continues to conduct Spice Appreciation Classes around Australia, while Liz cooks tasty spiced morsels. Ian is a regular guest on ABC radio and also manages to fit in guest spots on television, various radio stations in Australia and on cable T.V.